The sacroiliac joint is formed of the sacrum, a large, triangular shaped wedge of bone at the base of the spine. It is comprised of 4 large, immobile segments of bone that are fused together. The sacrum is joined either side to the ilium of the pelvis. On either side of the sacrum are two very large bones that are described in anatomy by their shapes and contours and labelled as 3 distinct areas, the ilium, the ischium and the pubis. The two pubic rami join together at the front of the pelvis to form the synthesis pubis. These 3 bones form the pelvic ring and are the base of the abdominal cavity, which houses and protects many vital organs and blood vessels. The formation of these bones and the way they join together is with an interlocking system, known in the literature as “form and force closure”1. As you can see from the pictures, the two sides of the joint formed by the iliac bones creates a valley like V shape. Funny enough, the sacrum is a V shaped structure that fits into the valley formed by the two iliac bones, like the keystone of an arch or bridge. This is a great shape for naturally resisting the downward force of gravity and the mass of the upper body, stopping the sacrum from being able to fall down out of the joint. From above, the joint surfaces are wider at the back and narrower at the front2. This allows a natural resistance to backward motion of the sacrum. From the side, the sacrum is tilted forward (albeit at varying degrees within the population3), which again adds stability to this interlocking mechanism of the joint itself. It has been found that because of the joints shape and the lack of joint space, it is impossible to perform injections into the joint from behind because the joint surfaces prevent entry of the needle into the joint itself4–6. The sacroiliac joint is supported by the largest and strongest ligaments found in the human body2. Ligaments provide stability to a joint stopping the bones from moving too much or far away from each other, resulting in subluxation (partial dislocation) or full dislocation of the joint. In every other joint of the human body, there is at least one muscle that originates on one bone, crosses the joint surface and inserts (attached) to the bone on the other side of the joint. 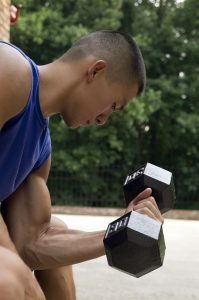 This muscle then acts as a primary mover of the joint, for example, the biceps muscle originates on the shoulder blade (the Coracoid process and the Supraglenoid tubercle7), crosses the elbow and attaches to the radius (the radial tuberosity7) of the forearm. This muscle then acts as a primary mover of the elbow into flexion. There are no muscles that originate on the sacrum that cross the sacro-iliac joint to the ilium, the lumbar spine or the hip that act as a primary mover of the sacrum. The gluteus maximus is shown to attach to the posterior sacro-iliac ligaments and the sacrotuberous ligament8. The long head of the hamstring muscle biceps femoris also attaches to the sacrotuberous ligament. The piriformis muscle also attached to the outer surface of the ilium and onto the posterior sacroiliac ligaments. None of these muscles are primary movers of the sacro-iliac joint, however when these muscles contract, they pull on these ligaments causing an increase in load on the SI joint, compressing the joint surfaces together2,6. In a nutshell, the controversy regarding the sacroiliac joint can be summed up simply with, does this joint move? The answer to this question is yes, it does move. However, let’s have a look into the biomechanics research conducted to come to this answer. The research shows that this joint moves 0.043mm9 and somewhere between 0.0° and 0.431°9,10,10 depending on the study you read. Thus, while the answer to the question is technically yes, the joint is clearly very stable and capable of less than half a millimeter of movement. The pubic synthesis was found in the same study to have a mean range of motion of 0.03mm. 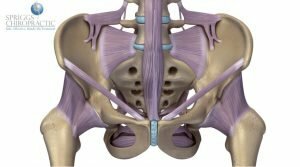 Another study by Sturesson et al10 looked into ladies who have had multiple children and performed a 3-D x-ray study of the ladies pelvis during a split legged position called the ‘straddle stride’ position, which puts huge forces through both sides of the sacro-iliac joint and synthesis pubis. They found that these ladies sacroiliac joints moved within a range of 0.1° and 1.3°. In order to see and measure this amount of movement, specialist computer analysis is required. This joint is incredibly stable and is designed to limit mobility. The last point I would like to make on the stability of this joint is that it has been found to have a very high coefficient of friction, meaning it’s like sand paper on the joint surfaces11,12. These researchers found that the joint surfaces of the sacrum and the ilium have roughened edges, which increases fiction between the sacrum and ilium, which reduces the amount of motion. Some patient’s do truly have sacro-iliac joint instability. This is usually the result of significant trauma to the pelvis, such as a car crash, motorcycle crash or a fall while horse riding among others. The saddle horn injury during horse riding in particular has been shown to result in SI joint instability due to fracture and separation of the synthesis pubis13,14. In these cases, external bracing and compression belts have been found to provide pain relief and increase stability13. However, in the long-term, these patients require exercise rehabilitation to the pelvis and lumbar spine to strength and stabilize the structure again. Surgical pins and plates are also used to stabilize the SI joint and synthesis pubis in severe cases. During late stages of pregnancy, ladies naturally secrete a hormone called relaxin, which causes these tissues around the SI joint to relax to allow increased movement during labor. However, as Sturesson et al found, this does not continue following the birth and the pelvis returns to its stable state again. The sacro-iliac joint has been proven to cause pain and contribute towards back pain5. This post is not suggesting for a moment that this joint is not capable of eliciting pain in patients with low back and leg pain. What this post has been designed for, is to inform patients about what this joint actually does and show that with the appropriate treatment plan, SI joint pain is very effectively treated using manual therapies. For more information regarding this very interesting joint, click on this link to watch Dr Deed Harrison of Chiropractic Biophysics Non-Profit discuss this topic is great detail. Arumugam A, Milosavljevic S, Woodley S, Sole G. Effects of external pelvic compression on form closure, force closure, and neuromotor control of the lumbopelvic spine–a systematic review. Man Ther. 2012;17(4):275-284. doi:10.1016/j.math.2012.01.010. Harrison DE, Harrison DD, Troyanovich SJ. The sacroiliac joint: A review of anatomy and biomechanics with clinical implications. J Manipulative Physiol Ther. 1997;20(9):607-617. Roussouly P, Pinheiro-Franco JL. Biomechanical analysis of the spino-pelvic organization and adaptation in pathology. Eur Spine J. 2011;20 Suppl 5:609-618. doi:10.1007/s00586-011-1928-x. Bellamy N, Park W, Rooney PJ. 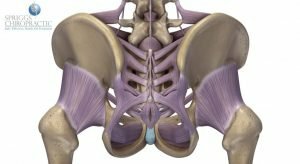 What do we know about the sacroiliac joint? Semin Arthritis Rheum. 1983;12(3):282-313. Schwarzer AC, Aprill CN, Bogduk N. The sacroiliac joint in chronic low back pain. Spine (Phila Pa 1976). 1995;20(1):31-37. Harrison DE, Harrison DD, Haas JW, Oakley PA. The Sacroiliac Joint: Antomy and Biomechanics. In: Spinal Biomechanics for Clinicians. 1st ed. Harrison Chiropractic Biophysics Seminars Inc; 2003:127-148. Netter F. Upper Limb. In: Atlas of Human Anatomy. 4th ed. Philadelphia: Saunders Elsevier; 2006:420. Netter F. Bones and Ligaments of Pelvis. In: Atlas of Human Anatomy. 4th ed. Philadelphia: Saunders Elsevier; 2006:352-354. Simonian PT, Moutt C, Harrington RM, Mayo K, Tencer A. Biomechanical simulation of the anteroposterior compression injury of the pelvis. Clin Orthop Relat Res. 1994;309:245-256. doi:10.15713/ins.mmj.3. Sturesson B, Uden A, Vleeming A. A radiostereometric analysis of the movements of the sacroiliac joints in the reciprocal straddle position. Spine (Phila Pa 1976). 2000;25(2):214-217. doi:10.1097/00007632-200001150-00012. Vleeming A, Stoeckart R, Volkers AC, Snijders CJ. 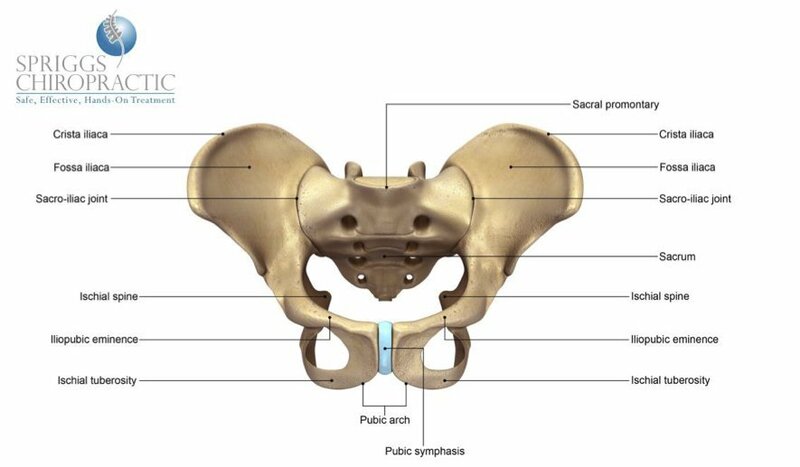 Relation between form and function in the sacroiliac joint. Part I: Clinical anatomical aspects. Spine (Phila Pa 1976). 1990;15(2):130-132. Vleeming A, Volkers AC, Snijders CJ, Stoeckart R. Relation between form and function in the sacroiliac joint. Part II: Biomechanical aspects. Spine (Phila Pa 1976). 1990;15(2):133-136. Flynn M. Disruption of symphysis pubis while horse riding: a report of two cases. Injury. 1973;4(4):357-359. doi:10.1016/0020-1383(73)90017-X. Collinge CA, Archdeacon MT, LeBus G. Saddle-horn injury of the pelvis. The injury, its outcomes, and associated male sexual dysfunction. J Bone Jt Surg – Ser A. 2009;91(7):1630-1636. doi:10.2106/JBJS.H.00477.